Call Today For More Mitzvah Info! You know what they say, “the days are long, and the years are short” Time to start planning for your Bar or Bat Mitzvah. It seems like just yesterday you were sending your child off to Sunday School. Then Hebrew classes began. Before you knew it, you were driving to the Bar / Bat Mitzvah tutoring sessions. This may not be your first time planing a Bar or Bat Mitzvah Party, but it might be your first experience with 4 Sure Entertainment. When we started we had one goal in mind… KIDS PARTYS! We enjoyed performing at Bar and Bat Mitzvahs all over Chicagoland. Turns out most families that took their children to Israel to have their service did NOT want to pay the typical Bar or Bat Mitzvah Prices. 4 Sure came up with a way to make sure you have the FUN you want, and the price you can AFFORD. How can 4 Sure Entertainment help with your Mitzvah plans? We can PLAN your Bar/Bat Mitzvah. Our DJs are well versed and able to play for both kids and adults. Our D.j.s are trained to read the crowd and program the right tunes to get everyone on the floor. We make sure the music is at a desirable volume. Our DeeJay’s are friendly and always eager to take requests. Its your party, have it your way. We will work our hardest to make it the best. Our Djs will meet with your family 6 weeks before your special event. We believe it is important for there to be a connection with your family and our CREW. During the meeting, we will take requests, and go over the schedule. This way when the party arrives, you’re able to be a guest at your own event. You can sit back, relax, and let our staff run your party, the way you want it. Experience: We have been in the Mitzvah industry for almost eighteen years. We know exactly how to keep your friends dancing, and will have them complementing you for weeks. Mobility: We are a Mobile Music Entertainment Dj Company that proudly offers high quality entertainers for economical prices. We have played here, there and everywhere. 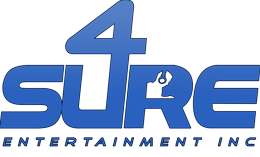 Professionalism: 4 Sure has been providing clients with excellence in entertainment since 2008. Our Djs have been experts for 7+ years. TEAM Work: We will blend our services into your event as a part of your team so you can be a guest at your own party. We LOVE what we do and we have fun creating ideas and organizing events for our clients.